Education / What Is ERP? Summary: What is ERP? ERP is software that unites financial data with manufacturing data to streamline the production stage of the product lifecycle. Enterprise resource planning, or ERP, is the anchor for most manufacturing companies. (the answer is ‘yes’ by the way). But understanding: what is ERP? gets a little tricky because it does a bit of everything. It’s the original octopus software. 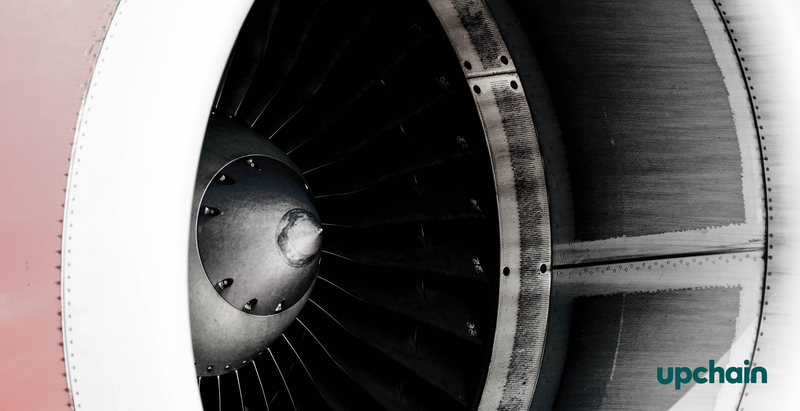 So we dived into what it is, where it came from, where it fits in the modern manufacturing tech stack, and where ERP is going. ERP came about in the 90s to streamline processes and improve data visibility around finance, project management, and manufacturing. That’s the heart of ERP: a system that unites manufacturing data and financial information with project management data to grease the wheels. Basically, think of everything that finance touches in a business. All of that can conceivably be run through an ERP. An ERP is a system that brings together engineering data with financial and business data so that business stakeholders like accounting, finance, and HR are in-tune with manufacturing and business units. So where did ERP come from and how did it become the heart and soul of modern manufacturing software? As Oracle pointed out, ERP came about in the 1990s. But things like this don’t just spring into being overnight. ERP evolved over decades, starting around the 1960s. Remember, this was the era of NASA. Space was cool. And products were getting a lot more complex and corporate structures were becoming more defined. Companies were getting larger. By the 1970s were starting to be compiled into material requirements planning, or MRP. MRP also included the ability to schedule manufacturing, incorporating project management. Over time, MRP morphed into manufacturing resource planning, or MRP-II. MRP-II brings together all the functions we just mentioned and also includes simulation capabilities. MRP-II also began to look a lot more like the ERPs were used to seeing today. For starters, MRP-II included things like HR and dove deeper into accounting and finance. Second, it was a modular construction. Things like CRM, HR, Accounting, CAD/CAM, and more could be bolted on as needed. Finally, we get to the emergence of ERP. ERP emerged in the 1990s ahead of Y2K, fuelled by easy credit, an enthusiasm for technology, and a very real concern that computers would meltdown when the year 2000 rolled over (they didn’t). The focus shifted from managing inventory to managing all data generated by an organization. Terms like “single source of truth” started to be thrown around a lot more. And we arrive at the end of the ERP road. ERPs are now spread throughout organizations of all sizes (not just enterprises) and continue to swallow software functions, especially front-end functions like ecommerce, CRMs, business intelligence, marketing automation, and more. Where does ERP fit into a manufacturing tech stack? What is ERP in terms of the overall tech stack? And that is an excellent question. 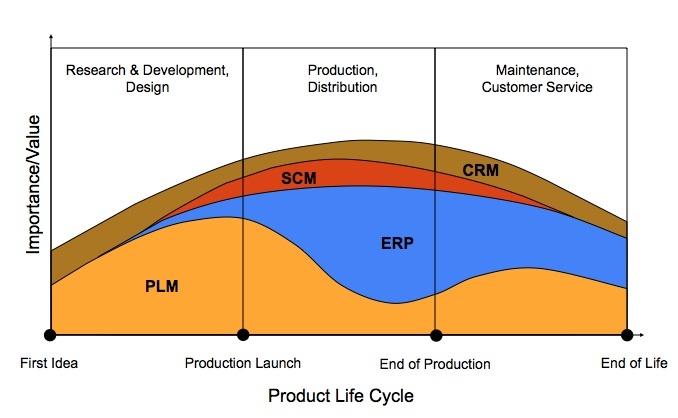 According to a very handy diagram from Zero Wait-state, ERP fits mostly in the space between product launch and end of production, moving into end of life when you map ERP against the product lifecycle. What this means is that ERP is primarily involved in production and manufacturing. It’s about building actual products, turning products from a pile of useless raw materials into things like iPads and Teslas. One easy way to think about this is to contrast it to a PLM product. PLM is tied closely with CAD data and help engineers and designers take a product from an idea to a design that’s ready to send to the plant. ERP is designed primarily to take that design and turn it into a product consumers are ready to buy. What is ERP going to be in the future? There are two main ideas on future of what ERP. First, it’s going to continue to grow and basically swallow every other software unit out there. SCM, PLM, CRM – it’s all going to be provided by a single ERP provider. But we don’t think that’s likely to happen. As products and production processes get more complicated, the software needed to go from concept to delivery gets more complicated too. The concept of one big solution with all the answers under one roof for all system and solution requirements is unrealistic. We think that the future of manufacturing systems lies not with generalists, but with specialists. ERP will go (eventually) to the cloud and end up covered in flexible webhooks or use open APIs to connect to other systems. Data will move between specialized software seamlessly as organizations use the tools they love without worrying about how to translate data into a specific ERP schema. What is ERP? ERP is software that unites financial data with manufacturing data to streamline the production stage of the product lifecycle. It emerged first in the 1990s but has its roots in earlier MRP and MRP-II back in the 1960s. Today, ERP is used by everyone from government to nonprofits to engineers and more. It’s an integral part of the enterprise software stack and, increasingly, is used by SMBs to deliver products on time and on budget. The future if ERP isn’t certain. It’s definitely not going anywhere, but it’s going to have to be more flexible in terms of integration to facilitate data movement across software stacks. With increasing complexity and the move towards cloud products, ERPs need to focus on linking together the financial data they with the specialized software their clients use.